You might think that my self-confessed love of astrology (see last week’s column), would mean that I love as well any and all other space-related mystical undertakings. Ancient civilizations cavorting with space aliens? Faces on Mars? Magnetically powerful hidden planets? Why not? You could make some of the same arguments that I made in favor of astrology. The people who talk about these sorts of things are interested in the sky and what is out there. They are seeking to make meaning out of patterns to see in the world. Isn’t that what I do? What is not to love? In the days following the demotion of Pluto my email inbox filled to capacity daily with notes from people all over the world. 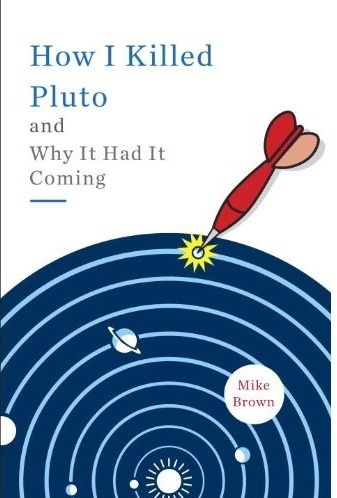 People quibbled over the new definition of the word planet, suggested new approaches to thinking about planets, asked details about the discoveries that led to the new definition, suggested names for some of the newly discovered objects, and, occasionally, told me what a bad bad person I was for having killed Pluto. The amount of email was staggering. Though it took me a couple of months, I eventually responded to almost every email that I received. The only ones that I did not bother to take the time to respond to were those that I classified as pseudo-science. It was not worth it. I do not ♥ pseudo-science. What is pseudo-science? I think of it as an attempt to understand or describe the physical world while ignoring (or misunderstanding) the incredibly powerful methods humans have stumbled upon over the past few centuries that have allowed us to comprehend and build upon the world around us. What are these incredibly powerful methods? Generally we lump them all together under the heading of the “scientific method”. My definition of what the scientific method is goes something like this: come up with the simplest explanation that is consistent with everything about reality that you know, and discard or modify this explanation when you find out it is no longer consistent. The reasons that this scientific method works so well are twofold. First, the method gains invaluable leverage because of the amazing power of feedback. Feedback is used to get closer to the right answer, which is much better than having to know the right answer from the beginning. Feedback is a powerful thing. Imagine getting into a car you’ve never driven before and being required to navigate a tree-lined obstacle course. You could do it, even though you don’t initially know the details of how hard to press the gas pedal to go a particular speed or how far to turn the steering wheel to turn a certain angle. You could do it because you just use the feedback to correct your foot or your hands if you go too fast or start to veer off the road. Having no feedback, on the other hand, is like being asked to do the same course blindfolded. You have to know how to do everything precisely correctly ahead of time. You have to know that this gentle curve requires just a push of the wheel while the sharp turn requires cranking the steering wheel all the way over. Chances are you’d finally take the blindfold off when you ran into a tree. Almost everything that we do well we do by feedback. Try this experiment. Close your eyes, put your arms out in front of you, and try to touch your pinkies precisely together at their tips. You’ll probably get close, but without the visual feedback your body doesn’t even know how to find other parts of itself. Harnessing the incredible power of feedback is a good way to help understand reality. Give up feedback and you only have two choices: do everything perfectly or crash into trees. But feedback by itself is not enough to keep the scientific method working. Feedback will allow you to stay centered on the road, but it will not tell you which of the many different routes is the right one to take. The second reason that the scientific method works so well is that it also provides the roadmap for where to go. Any phenomenon seen in the physical universe has an infinite number of possible explanations, but, according to the scientific method, when in doubt, you should always assume that the simplest explanation that still fits all of the observations is correct. The practical beauty of making this assumption is that of the infinite possibilities there is more or less one simplest explanation, so you know precisely which route to take. The more subtle beauty of making this assumption is that, frequently, it actually seems to work, or at least work well enough. The fact that the simplest explanation comes close to working is more profound than anyone ever gives it credit for. It is the sign that we live in a physically orderly universe. There is no reason to have guessed that from the beginning. It is easy to imagine, instead, that we might have come into existence in a universe where the capricious gods were to blame for natural phenomenon and that prediction and understanding were impossible, or, alternatively, that the laws governing natural phenomena simply changed from day to day or minute to minute with no fixed schedule. In a universe like that, making the assumption that the simplest explanation is correct might get you nowhere. Science and the scientific method developed not because they are obviously the correct thing to do but because they worked. We live in a profoundly orderly universe. I am currently 32,000 feet above Oklahoma, riding inside of a contraption that was put together by many many decisions made on the basis of the assumption that the simplest explanation about a phenomenon was the correct one. If the scientific method didn’t work I would currently be falling Icarus-like to the ground. So what about pseudo-science? Previously, I described it as an attempt to explain physical reality without using what I have argued is the incredibly powerful scientific method. But before I go on, let me digress one more moment to talk a little more of astrology, since I think that, in the end, my tolerance of astrology helps to explain my aversion to pseudo-science. Most scientists would probably throw astrology in with the pseudo-science, so what do I think is the difference? Astrology, at least as I think about it, talks about humans and their interactions and thoughts and dreams. Astrology deals with the interior rather than exterior world. While science seems to be good for understanding the physical exterior world, I think the inner world is a no-man’s-land. Astrologers? Psychologists? Self-help gurus? As far as I know, astrologers understand people and their condition as well as anyone else. And I like them better, because they like stars, but I will admit a certain prejudice there. I read somewhere an astrologer classifying herself as someone who practices one of the intuitive arts, and that sounds about right to me. Even the relatively trite pop-astrology of daily horoscopes tends to stay away from exterior reality. How can you object to “For whatever reason, the universe sees fit to reward you.” Or “Smooth sailing is assured as you spread your wings.” I got a fortune cookie after dinner last night. It said “You are attached to home and yearn for your family.” I smiled. I was 3000 miles from home and waking up the next morning at 2am to catch an eyelid-achingly-early flight so I could be home in time to have lunch with my wife and pick up our daughter after work. It was a good thing that I picked up the right cookie. Pseudo-science, on the other hand, does not deal with emotions and thoughts and feelings. Like real science, it attempts to describe physical reality. Aliens did visit the Mayans. You could have met them yourself if you were there. There is a face on Mars. You could go and walk on it and post the video on YouTube. But pseudo-science deals with objective reality more through the methods of the intuitive arts than the methods of science. And that is where it goes wrong. In the intuitive arts you are allowed – indeed required – to get a feeling that something is true and then spin a reality out of it. This intuitive spinning is one of the best ways of describing and trying to understand the malleable human consciousness, but it falls flat when trying to describe exterior reality. Religion is the ultimate intuitive art, but when the Catholic Church insisted, based on its intuition or on the intuition of those who wrote the Bible millennia ago, that the earth is literally the stationary center of the universe it is pretty easy to see that the intuitive approach to physical reality gets you nowhere but the inquisition. The most common pseudo-scientific email that I get these days consists of questions about the relationship of things I have discovered in the outer solar system to the planet Niburu, known to the Babylonions. I will admit to not knowing much about what the people writing are talking about, but here is what I can gather from the emails: the Babylonians allegedly had the inside scoop that there were 12 planets, because they were they knew they we were actually somehow created by aliens from this 12th planet. OK. Most alarmingly, this 12th planet is on a very elongated orbit that usually keeps it quite far from the earth, but, on the occasional times it swings by, the strong magnetic field of Niburu somehow flips the magnetic field of the earth, causing massive destruction. This tale originated from the writings of one person translating Babylonian text, as far as I can gather from the emails I get. I read the emails, but I never respond. So let me, now, respond, by examining this tale as a scientist. First, let’s figure out what is actually known. As far as I can tell the only part of the tale that is known to be true is that someone wrote these fairly astounding things. Given the choice between believing such incredible things and coming up with a simpler explanation – the man was insane, fraudulent, or delusional – the simple explanation seems quite palatable. But let’s take another step and believe the allegation that the Babylonians talked about 12 planets. A complicated explanation is that aliens came and told them about it. Why not try another equally complicated explanation, like, for example, the Babylonians had the ability to transport around the solar system and saw the planet for themselves. Or they could travel in time and knew that we knew all of these planets. Or that at the time of the Babylonians there were planets that we don’t yet know but those planets had laser beacons on their surface so they could easily be seen without telescope. The list is endless. Let’s try, instead, a simple one: they – like other primitive civilizations – had a mythology that did not adequately describe the physical universe. My objections above are all to the part of the scientific method where you chose the simplest explanation, but the Mayan planet followers seem to violate a more fundamental rule. They don’t accept feedback. Even if you make the mistake of not finding the simplest example, feedback will still eventually do its magic. The Babylonian planet hypothesis is unnecessarily complicated, but if we were to accept it as a viable hypothesis we would still have to ask: does it work? And I would have to say no it does not, and let me count the ways. First, if this planet were out there as described we would simply have seen it by now. We haven’t. Being the person who has been doing the looking, I find this argument particularly compelling. Second, if the planet had the orbit that is ascribed to it, it would only last for about a million years before it came too close to Jupiter and got ejected out of the solar system. Third, we know enough about magnetic fields that we can quickly calculate that if, against all odds, the planet really did exist, a swing by would do absolutely nothing to the earth’s magnetic field. Fourth,…… I could go on and on, but it is too late, the car is wrapped firmly around the tree with the foot still pressing the gas pedal to the ground. Feedback would have helped. How about the pictures take that appear to show a face on Mars? Complicated explanations: built by aliens, put there by ancient terrestrial civilizations capable of space flight, an actual living creature/ Simple explanation: if you look at enough random pictures you will find a pattern that looks unusual. The simplest way to see which of these was correct was to take pictures from different angles with different lighting. No face appeared. Complicated explanations: NASA can’t be trusted and is covering up the existence of the face, the face knew we were looking so hid, the new pictures really does show the face but you have to know how to look just right. The simple explanation: the face was a trick of light and shadow. The pseudo-scientists were wrong about the face on Mars. Physical reality is not terribly amenable to the intuitive arts. Being wrong is not shameful (good thing, or I would have had to hide away and quit astronomy many years ago), but being wrong and refusing to look at and seriously consider the contrary evidence gets you nowhere in your quest to understand reality. To my (incomplete) knowledge, none of the advocates of the face on Mars is willing to accept the simplest explanation, even in light of quite strong new evidence. If they won’t bother to consider the possibility that their original explanation is wrong, having a discussion with them is simply a waste of time. You might as well try to convince someone that they don’t really feel the emotions that have just passionately explained to you. So I don’t answer the emails from pseudo-scientists. You are allowed to think that my reaction is extreme, given that I answered email of almost every other type of flavor. But I hope you give me dispensation on this one. As a scientist, I have a particularly hard time with people who reject the use and conclusion of science for the things that science is particularly well suited for. Not everything needs to be about science or about physical reality. The joy that I feel as my airplane gets closer and closer to the city where my wife and daughter are waiting is more about song or more about poetry than about physical objective scientific reality. But as the wheels of the plane touch the ground I am going to say a silent thanks to the scientists who rejected 20 different chemical formulae before finding one that works just right for making the vinyl for the tires that are going to quickly bring me to a stop and allow me to step safely, once again, on the ground. Mike, you forgot one scientific approach,- that is historical. If people had seen some object on sky, they had described that's object's path on sky, they had written, drawn it even on astromap, there were effects on Earth, water masses and if those effects are even written in sediments, in ice core- can be dated and even are in coincidence with those paper, stone artefacts, so it is science, not pseudoscience!!! There is again gravity anomaly (not only Pioneers or Voyagers have it) in orbits of NEO satellites, what is exactly 1/million of Earth;s gravity on geostationary orbit. This gr. force so is equal to force from X, if X is 2 bil. km from us and have mass 20MJup, what is in coincidence from my search results,..
Mike, you again forgot to answer my questions. Why are all planetoids behind Pluto, Pluto inclusive close to their perihelias, aphelias,...isn't it due to projection of opposite motions of Sun with inner planets to arriving X to its perihelia? Isn't it so unimportant to you?????!!!!! not worthy to answer?????!!!!! I was researching about this so-call end of the world theory about this fake planet, I am very pleased that I am not the only one who thinking it is a load of rubbish. We must always challenge this pseudo-science like this fake theory which not old, it was dreamed up by some sci-fi writer in the 1960's to sell books. And to Senmut & Don't Be Evil, you are so wrong as there is no evidence of your theories, it just junk science & I would as far to say that more of these theories have only appeared in the last hundred year,at the most, mostly from the 1950's onwards.